Cut down the time you spend developing data-intensive client/server applications. IdeaBlade's free DevForce Express is a developer productivity solution for .NET that is fully integrated with Microsoft Visual Studio, which helps professional developers build, maintain, and operate smart client Internet applications by bridging the infrastructure gap between the Application layer and .NET. Applications built with DevForce Express may be developed, deployed, and resold royalty-free. Get a focused, first look at the features and capabilities in Microsoft Visual Basic 2005, Visual Studio 2005, and .NET Framework 2.0. If you currently work with Visual Basic 6, these authors fully understand the adoption and code migration issues you’ll encounter. They’ll step you through a quick primer on .NET Framework programming, offering guidance for a productive transition. If you already work with .NET, you’ll jump directly into what’s new, learning how to extend your existing skills. From the innovations in rapid application development, debugging, and deployment, to new data access, desktop, and Web programming capabilities, you get the prerelease insights and code walkthroughs you need to get productive right away. Upgrading Microsoft Visual Basic 6.0 to Microsoft Visual Basic .NET is is the complete technical guide to upgrading Visual Basic 6 applications to Visual Basic .NET, covering all upgrade topics from APIs to ZOrders. It shows how to fix upgrade issues with forms, language, data access, and COM+ Services, and how to upgrade applications with XML Web services, ADO.NET, and .NET remoting. It also provides big-picture architectural advice, a reference of function and object model changes, and hundreds of before-and-after code samples. Visit the Future of Microsoft Office portal for the deal on Office 2007. Get details of features, bundling, and pricing, and the new Enterprise Edition. Advanced Basics: Set Word Document Properties Programmatically Ken Getz shows you how to set document properties for Word docs programmatically. Office Unbound: Bring Your Documents To Life With Data Binding In Visual Studio Tools For Office Thanks to Visual Studio 2005 Tools for the Microsoft Office System, Windows Forms controls added to a workbook or document can be bound to databases, Web services, or objects. Find out how. Outlook Add-Ins: Improve Your Outlook With Visual Studio Tools For Office Microsoft Visual Studio Tools for Office 2003 supported only Microsoft Word and Excel. The new 2005 version, however, has the tools you need to create managed code add-ins for Outlook 2003. The System.Windows.Forms.TextRenderer class provides support for complex scripts in Windows Forms controls so you can render text the way you want and support international locales. Winning Forms: Practical Tips For Boosting The Performance Of Windows Forms Apps Techniques you can use to ensure that Windows Forms-based apps provide optimal performance to match the rich UI responsiveness they’re known to provide. The Windows Command Shell provides direct communication between the user and the operating system using the command interpreter Cmd.exe, which loads applications and directs the flow of information between applications. Using the Windows Script Host, you can return useful system information to your MS Access and other Office applications. Returns the current date. Uses the same format as the date /t command. Generated by Cmd.exe. Recent Blog articles that are crucial for successful STO deployment. Using the Server Capabilities in Microsoft Visual Studio 2005 Tools for Office to Build a Benefits Registration System. Build a Web app that dynamically attaches a VSTO customization to a document, caches the data, and delivers the document to a user from an HTTP Web request. MSDN Webcast: Creating Office Solutions with Visual Studio 2005 Tools for the Microsoft Office System Learn how code and the object model between Visual Studio and Office documents are moretightly integrated than ever before. Office Serverv line-up and the licensing information. 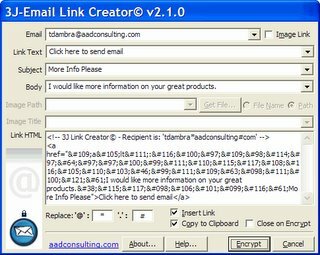 The new v2.1 of 3J - Email Link Creator is now available for free download from aadconsulting.com and is now also deployable as a FrontPage 2002/2003 Add-In. Fight SPAM: Encrypt Your Email Address! SPAM often originates from your own web pages by placing your email address in your web site pages. Along comes the Spammer-spider, harvesting any email addresses it finds. Not only will you receive SPAM from now on, your email address will also be sold to others, resulting in even more SPAM. As you need people to be able to contact you via email, you have to have your have an email link on your web site. Stop the Spammer spiders in their webs with this free application. 3J - Email Link Creator encrypts your email address in HTML to hide it from spammer robots.You can quickly create complete mailto links in HTML: including the body, subject and image link tags. Just enter your Email address and either the Link Text or Image Path fields. The other fields are optional. All link parameters are saved and available in droplists. Set the default Image path to simplify the creation of image links. 913031 Error message when you try to view or print a report in Access 2003: "Error 2501 The Open Report Action was canceled"